Sweet Potato ( Ipomoea batatas ). Rush Skeleton Weed ( Chondrilla juncea, ASTERACEAE ). 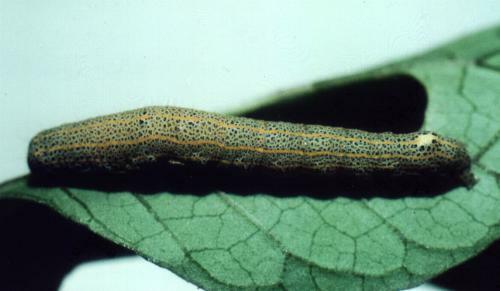 The caterpillar grows to a length of about 5 cms. It pupates in a cell in the soil. Specimens pupating in late April in Melbourne emerged as adult moths about eight months later. 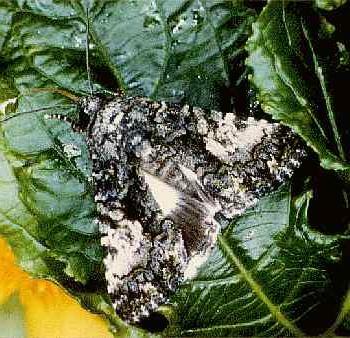 The adult moth is sooty black, with a light grey patch on the fore wings containing a pattern like an opening flower bud. The hind wings each have a white basal area and a white tornus and termen. 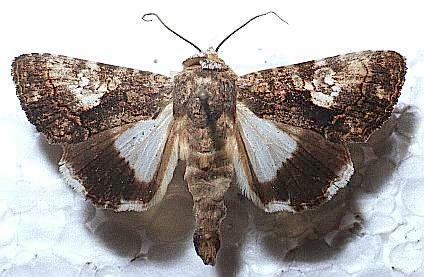 The moth while at rest, displays these white patches by opening and closing its wings. The undersides of the wings have white basal areas, and the fore wings each have a crescent-shaped black discal dot. The pheromones of the species and the courtship behaviour have been studied. The species is attacked by a Nucleopolyhedrovirus. Butterflies and Moths, Collins Eyewitness Handbooks, Sydney 1992, p. 262. Moths of Australia, Melbourne University Press, 1990, fig. 45.14, p. 451. Volume 1, Edition 10 (1760), Class 5, Part 3, p. 518, No. 121.